As mentioned in my last post, my mom and I went for a hike at the Perth Wildlife Refuge on the weekend. Partway along the trail, shortly after we were passed by a couple and their dog (despite the signs that say “no dogs”), we came across this mess of feathers scattered over the snow at the edge of the path. I always wonder, when I find a kill like this, what happened? Who was the victim? And who was the culprit? I’m pretty sure the dog didn’t do it, but beyond that the answer requires some investigation. I don’t really need to point out (though I will) that the victim was a bird. But what species? Quite often it’s difficult to tell just from body feathers, unless it’s a big puff of bright red (cardinal) or blue (Blue Jay). These feathers are pretty generic in colour, browns and grays. Often, the key to identifying a mass of feathers is to find the tail and/or flight (long wing) feathers. Both were present in this pile, but I focused on the tail feathers (which I lined up nicely in this photo). The long gray shafts, with a dark band and a white tip, are pretty distinctive. Don’t look familiar, though? That’s probably because they’re usually kept concealed underneath the two central tail feathers when the tail is folded closed, and the central feathers don’t bear this pattern. They belonged to a Mourning Dove: check out this fabulous flight image (not mine) to see the tail spread. That answers the victim. But who was the culprit? The answer is, in part, in the pile of feathers. Although certain carnivorous mammals aren’t opposed to taking birds if they have the opportunity to catch them, out here in the woods they’re probably not a common predator. The vegetation would make an attack difficult, for one thing. In the woods, Mourning Doves are more likely to be roosting than foraging on the ground. Still, a mammal such as a fox or coyote might have managed to get one out in the field a short distance away, and brought it here to eat. Both species will pluck their prey before eating. If the bird was killed by one of these guys, usually the feathers will show some damage from the canid’s teeth, holes in the barbs where the teeth bit through it. Occasionally canids will sheer off, rather than pluck, the long tail feathers from the body, leaving “clipped off” ends to the shafts. These feathers didn’t show either of those signs. Raptors will also damage the feathers as they pull them out of their prey, but because they have bills, not teeth, the damage appears as cut or crushed shafts, near the base of the the feather. 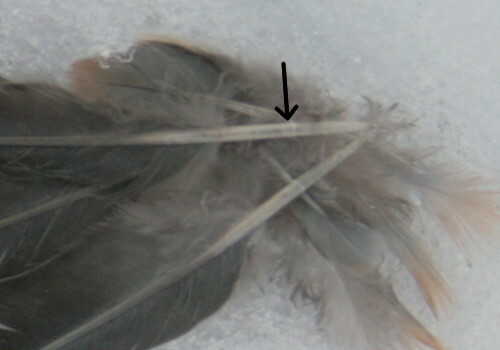 I think that the markings on the feathers I’ve indicated with an arrow, above, are the result of pressure from the bill as the feathers were pulled out. 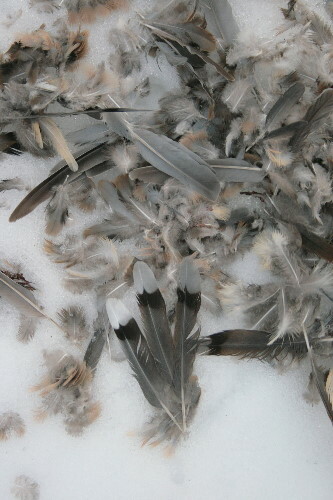 The other clue, at least to me, has to do with the arrangement of the feathers in a semicircle around the bloodied snow where the body was held. In my mind’s eye I can see a raptor standing over its prey, plucking feathers from the body and tossing them with a flick of its head forward of the prey (something like this, perhaps). When I’ve seen a cat plucking a bird it grabs a mouthful of feathers and then shakes its head, spitting them out without any particular direction in mind (you can almost hear it say “pthooy!”). I don’t know whether foxes and coyotes would fall into the former or latter plucking pattern. 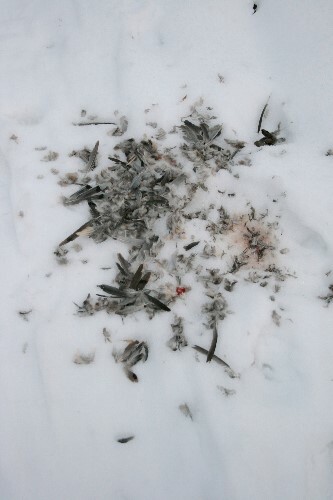 Putting these things together (raptor kill of a Mourning Dove in a forest) implies to me that the dove was killed by an accipiter, a group of agile hawks who are built for hunting and manoeuvring through trees. There are three that can occur around here: Sharp-shinned Hawk, Cooper’s Hawk, and Northern Goshawk. The goshawk is rare, and usually found in more pristine habitat than occurs at the Wildlife Refuge, although juveniles in particular may wander about in less-favourable habitat in winter. More probably it was a Sharpie or Cooper’s, however. Both will take Mourning Doves, though they’d be easier targets for the larger Cooper’s. 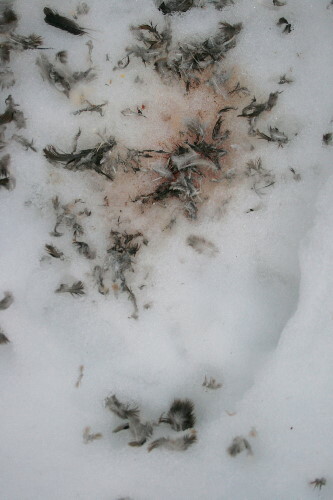 There was an impression in the snow on the side of the bloody print away from the feathers, where I imagine the raptor sat. I don’t know for certain if the print was from the bird’s body, but if it was, the size of it would also suggest the larger Cooper’s Hawk. Going back to the original scene, it looks like once the hawk got the bird mostly or completely plucked, it decided to take it somewhere else to eat. 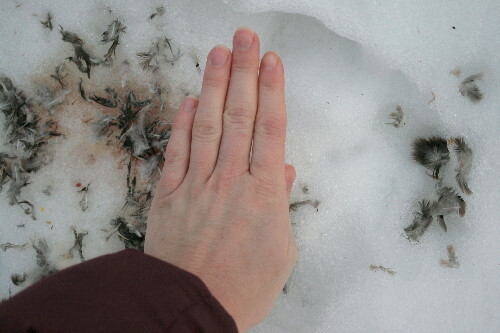 There was another patch of bloodied snow to one side of all the feathers, and I figure the hawk grabbed the bird to leave, took a hop, then decided it didn’t like the grip it had. 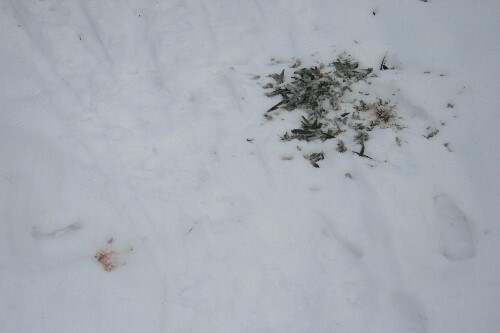 So it stopped to readjust the prey, putting the dove down in the snow and making another print before finally leaving. Excellent deduction. Holmes! Very cool! Quite the detective work, I must say! Very informative, esp. the part describing the damage to the feathers. How to put all the pieces together, including considering what species of raptor are the likely culprits and why. Another Marvelous Micro-Mystery, solved by super-sleuth Seabrooke! Fabulous & fascinating post. Thank you! I love a good mystery story. Cooper’s Hawk does seem more likely to take Mourning Doves, but when I found Mourning Dove feathers in my yard they were definitely plucked by a Sharpie… since the Sharpie was nearby with the rest of the corpse. I’m not sure if I ever wrote up that find. Loved your NCIS …great post. This is fabulous! I learned a lot and have been trying to piece together tracks in My Muskoka as the prints tell a story. Well done! It’s pretty interesting to try to track animals in the snow, Jenn. I like the idea of the animal having passed through while you weren’t there, crossing paths separated only by time. I’ve got a bunch of tracks-in-snow photos that I want to post (there’s always a backlog, it seems). John: when I was searching for images online of a hawk with a Mourning Dove, quite a few of the ones that came up were of Sharpies, which surprised me a bit – I think of them as targeting smaller species. Hello I just found your post, it was very interesting. I live in Haute Saone France and found a pile of feathers in my garden, yesterday,my neighbour and I think that it was the remains of a collared dove Killed by an epervier (hawk). So sad but the hawk was probably hungry.